Wildlife seems to be high on the agenda at the Hall this week, with a wide variety of creatures - great and small - making their presence known. This little fellow made an appearance in The Gatehouse last week - he was incredibly tiny and tangled in the cobwebs on the wall by the window. A quick check on The Bat Conservation Trust website confirmed that he really shouldn't be there and he was popped in a box awaiting collection by one of their Volunteers. At 9:00pm that night, a slightly odd assortment of people gathered around a cardboard box to see what it was that we had... a baby bat - less than a week old. It was imperative that he was reunited with his mother and we spent over an hour scouring The Gatehouse for possible bat entrances, but unfortunately none could be found. It was decided that perhaps mother had been carrying him whilst searching for food and either abandoned him - or he had simply fallen off. Back out in the Courtyard Nick (otherwise known as The Bat Man) set up his bat detector and we spent a further hour watching in awe as bats swooped and soared around us. He identified at least three species, including the solitary Long Eared Brown Bat. Nick is planning to return in order to identify the possible roosting sites within the Courtyard. Another new arrival at the Hall - Hadrian's Bees. If you read the Blog on a regular basis you will already have come across Hadrian, the Hall's Dry Stone Waller. 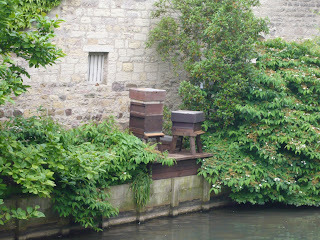 Not only is he a superbly talented waller, he is also a keen Apiarist. He has installed two hives of bees to the west of the Hall, positioned so that they will (hopefully) take full advantage of Spring Wood and the abundance of wildflowers that flourish there. That is wonderful news. Hurraah for saving one little bat. Well done you guys. I wished I had a workplace where bats can be seen. Lucky you found it! I am watching right now a family of magpies, mom and 4 chicks, who found our bird feeder. The mom sits on the feeder and pilfers seeds to the ground, where the chicks are waiting and picking it up. We go through 4 balls a day right now... grin. Since the baby bat's mother has not been found, what's going to happen to the little one now?